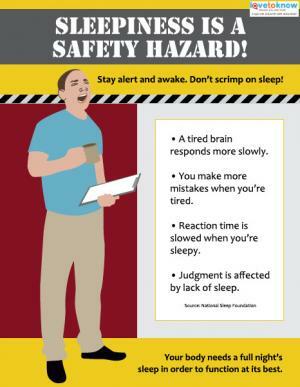 Download a sleepiness safety poster. These safety posters are free to download and all provide helpful advice for avoiding different types of injuries and illnesses. If you need help downloading these printable posters, check out these helpful tips. Sleepiness is a safety hazard. In fact, the National Sleep Foundation warns that sleepy people may think they aren't slowed down by their lack of sleep, but the truth is that sleep-deprived people simply don't function as well. You're much more prone to have an accident or get injured if you aren't getting enough sleep. The safety poster above reminds people that sleepiness can cause problems and stresses the importance of getting a good night's sleep each evening. Download a food safety poster. Safe food handling isn't something that only chefs should worry about. 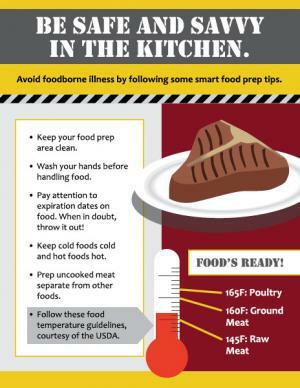 Whether you display this poster in a shared break room where food is prepared or if you use this poster as a reminder for home, it's a good reminder that improperly storing and preparing food can cause illness. According to FoodSafety.gov, one in six Americans will likely get struck with food poisoning this year. Avoid illness by following the tips provided in the poster. The United States Fire Administration reports that the leading cause of fires in both residential and non-residential buildings is cooking, followed by heating and carelessness for residential buildings. Fire can largely be avoided by taking some simple safety precautions. Download and post some of these free fire safety posters in prominent places to remind everyone to stay safe and avoid common fire hazards. Download a safe lifting poster. According to the American Chiropractic Association, back injuries are the most common reason for missing work and are the leading reason for disability worldwide. Many back injuries are completely avoidable by using the proper techniques for lifting. Lifting heavy items without help is a quick way to suffer a back injury. 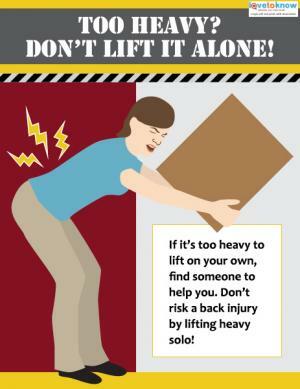 The lifting safety poster provided here reminds people to never pick up a heavy item on their own because it's far better to get assistance and lift as a team. OSHA advises everyone to use caution when working with electricity, and with good reason - electrical injuries can cause burns, injuries to internal organs, or even death. Whether at work or at home, it's important to stay safe around electricity. Download these free electricity safety posters to serve as reminders to avoid taking any chances when dealing with electricity and to never overload outlets. Millions of workplace injuries happen every year, according to the Bureau of Labor Statistics. It's important to remind workers to always stay alert and cautious, no matter what line of work they're in. Download these free workplace safety posters to remind workers to stay alert and take precautions to avoid injuries. There are free posters available online that cover all types of safety issues in various industries and businesses. OSHA offers a wide variety of workplace safety posters for download at no cost. Safety Awakenings offers a catalog of over 600 free downloadable safety posters. New York State's website provides free safety posters that are appropriate for both work and home. Accidents happen when people forget basic safety precautions. That's what makes safety posters such great tools to display - sometimes a simple visual reminder can help people avoid unnecessary injuries and illnesses.